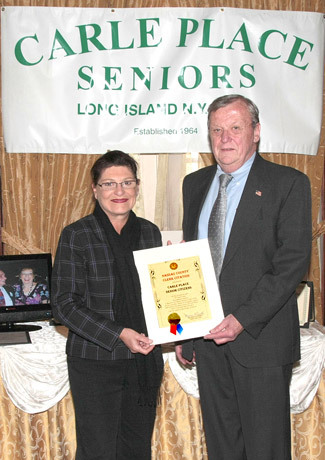 (Mineola, NY) Nassau County Clerk Maureen O’Connell recently attended a 50th Anniversary dinner dance in celebration of the Carle Place Senior Citizens. The event took place at the Westbury Manor. Clerk O’Connell was honored to be a part of the celebration that recognized all the seniors who have moved to Carle Place over the past fifty years to raise their families and support the schools. These seniors continue to tirelessly serve the community of Carle Place.